OEM Manufacturer of a wide range of products which include led testing power analyzer and single phase precision power analyzer. 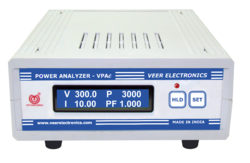 VEER Power Analyzer VPAe is result of continuous R & D activities. It is an accurate Instrument to test 1 Phase electrical Machines due to high sampling rate & simultaneous measurement of parameters. It has no adjustable components inside so, accuracy remains long time.It is capable to measure up to 300V 10A (20A also available on request).